Great for Title I-A, Title I, Race To The Top (RTTT), IDEA/Special Education/RTI, Title III, 21st CCLC, Title V, student gifts, and giveaways! Scroll completely down for a variety of Bargain Boxes! You asked for them and we got them! 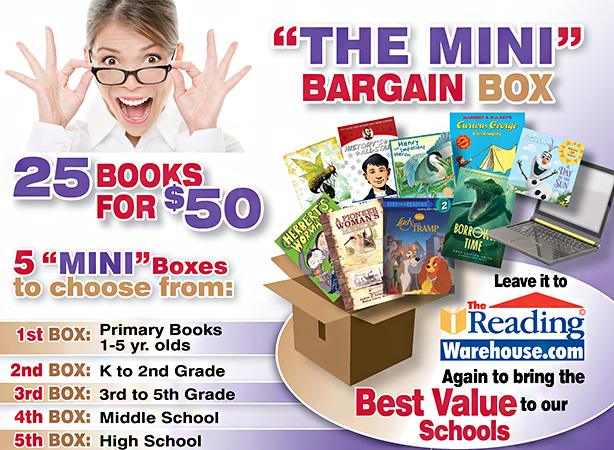 MINI Bargain Boxes from The Reading Warehouse with 25 NEW books for $50! These boxes come in 5 different varieties according to age level and could contain both hardcover and paperback books. Each box contains an assortment of books and All 25 books will be different - there will be no multiple copies of a single title!! Here is an opportunity to provide a book to every child in your school for very little money. This is also a great way for teachers and schools to build up their libraries for less! Sorry, we do not have lists of titles - That's why it's such a bargain! 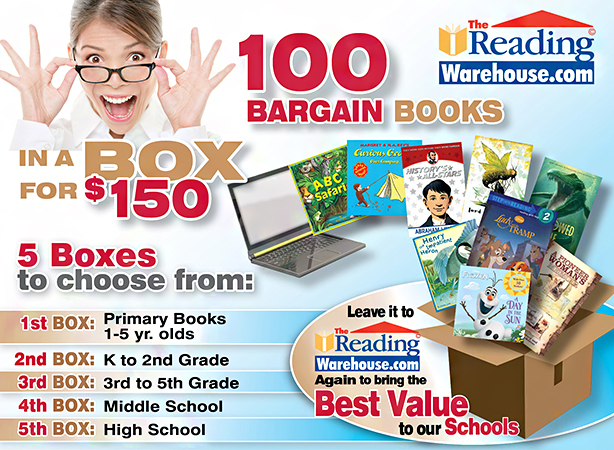 Bargain Boxes from The Reading Warehouse containing 100 NEW books for $150! These boxes come in 5 different varieties according to age level and could contain both hardcover and paperback books. Each box contains an assortment of books which will never have more than five copies of a single title. Understand that you will not be receiving 100 different books. Here is an opportunity to provide a book to every child in your school for very little money. This is also a great way for teachers and schools to build up their libraries for less!